Monographic institutions focusing on one single artist in their exhibitions are usually established posthumously, in recognition of artistic achievements and their social consequences. Especially during his lifetime, a monographic museum is a place for extraordinary self-presentation for an artist. It manifests the meaning and role of the artist within a society. Hermann Nitsch already has two monographic museums to his name during his lifetime. One is located in Mistelbach (Austria), the largest monographic artist museum of the country, founded in 2007 in the Weinviertel, the region where Hermann Nitsch lives and works. The museum considers itself a place for contemplation and sensuality. Its architecture is reminiscent of the ideal plan of a monastery, including building tracts and open spaces allowing the visitor to associate terms like nave, cathedral, aisle, or crypt. The artist’s will to push through to the real event, the real experience and the direct, intensive sensual perception and existence – unbroken to this day – is the point of departure and the eternal leitmotif for all the activities of the Nitsch Museum in Mistelbach. The Museo Nitsch in Naples, Southern Italy, was initiated in 2008 by Giuseppe Morra, Hermann Nitsch’s lifelong friend and collector. It defines itself as a museum in the sense of a transmitter of cultural stimulants, born in the performances and the performing arts, in order to mature among thoughts of a deeper cultural exploration and examination. 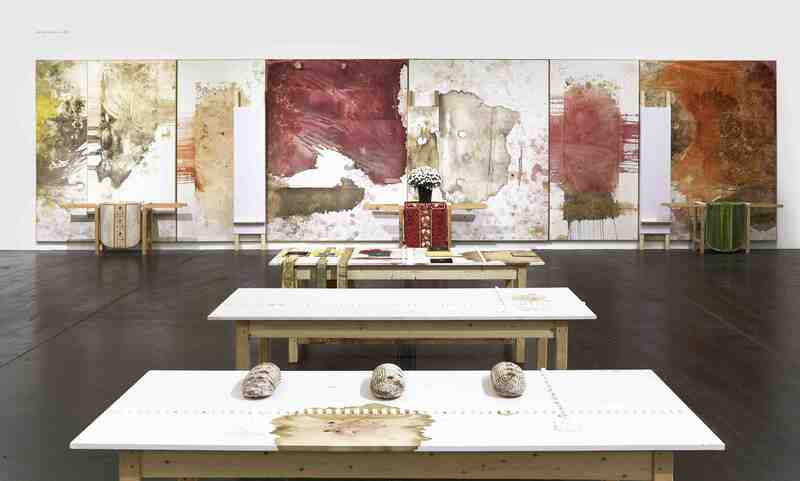 The Museo Nitsch is not only a place where Hermann Nitsch’s works are collected and exhibited, but it considers itself an active cultural protagonist, tasked with illuminating one of Austria’s most important artists critically and theoretically. Since the Museum’s founding, Giuseppe Mora has ensured that a group of scientists illuminates and documents Nitsch’s work from various perspectives, using very different approaches. In the fall of 2014 the two Nitsch Museums will exchange their works, perspectives and insights for the first time as part of a transnational cooperative exhibition. This is a novelty, since both exhibition places had previously devoted themselves to Nitsch’s work without any coordination. As part of this collaboration, the Museo Nitsch presents the project “arena – work out of the work”, which focuses on the genesis of relicts resulting directly from Nitsch’s actions, becoming independent artworks of their own. This project sees itself as a huge metaphorical board stretching through the entire main hall of the Nitsch Museum Mistelbach. The concept also takes into account a scientific and theoretical dialogue about the oeuvre and its influence on art and society. In exchange, the Nitsch Museum presents the exhibition “Painting Actionism – Excess and Sensuality” in Naples from October 25, 2014 onwards. September 27, 2014 »arena - work out of the work« at the nitsch museum Mistelbach, curated by Giuseppe Morra. October 25, 2014 »Painting Actionism – Excess and Sensuality« at the Museo Nitsch Naples, curated by Michael Karrer.